This is what I did this weekend. Here's my writeup. 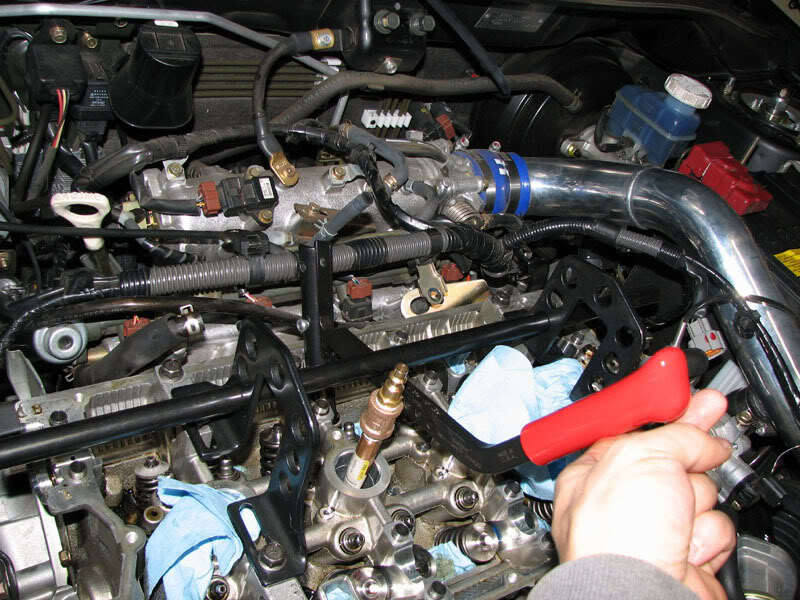 - This install assumes you know how to remove the timing belt and cams and starts after you’ve removed the timing belt and cams from the engine. - I would say that removing the timing belt is a definite must for this job. Once you fill the combustion chamber with compressed air, the piston moves to its bottom position. This may possibly cause an un-tensioned timing belt to jump at the crank. - This is pretty much a 2 person job. 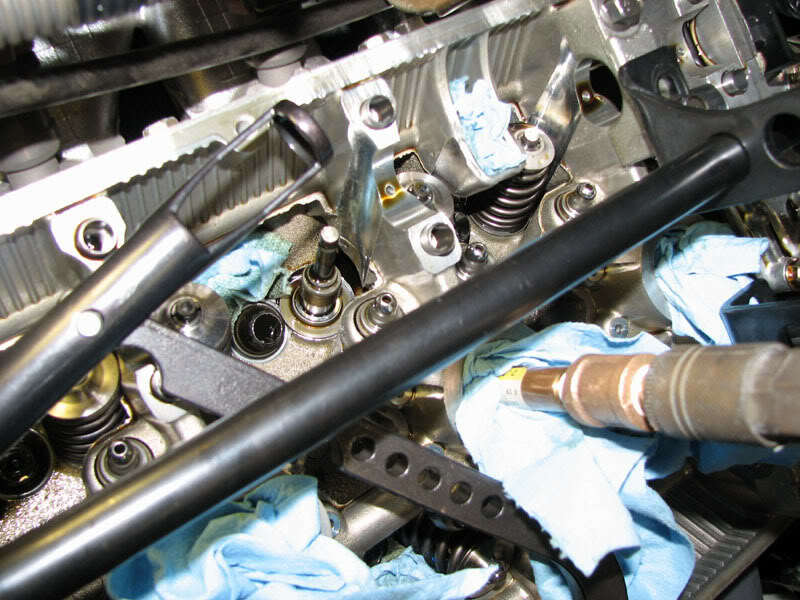 One person needs to compress the valve springs while the other removes the valve keepers. - It may be a good idea to have some extra valve keepers on hand before doing this procedure. - I took the adapter from my compression tester. The tube that goes from the fitting to the gauge has a check-valve on it and doesn't allow air to flow into the cylinder. 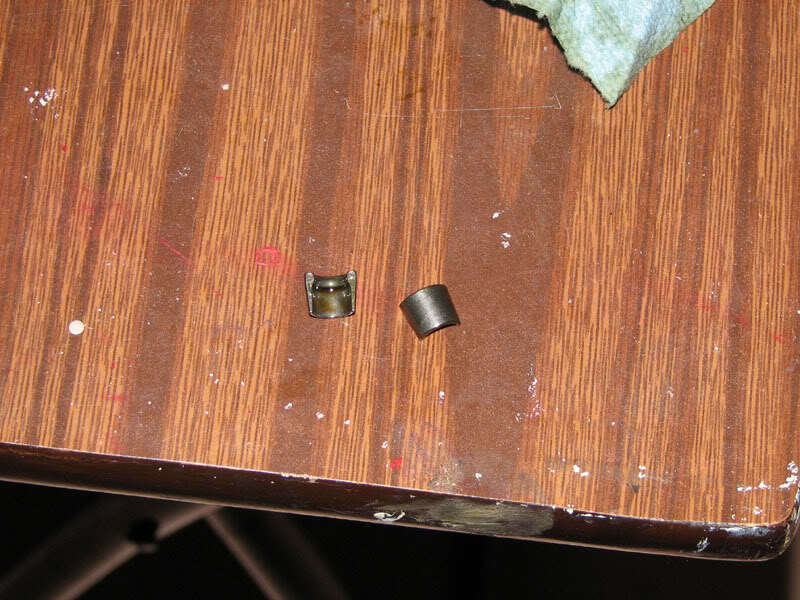 - The threads on the adapter are 3/8” NPT. I went to the local hardware store and picked up the appropriate fittings to create my adapter. 2. Screw the air line adapter into appropriate cylinder’s spark plug hole. 3. 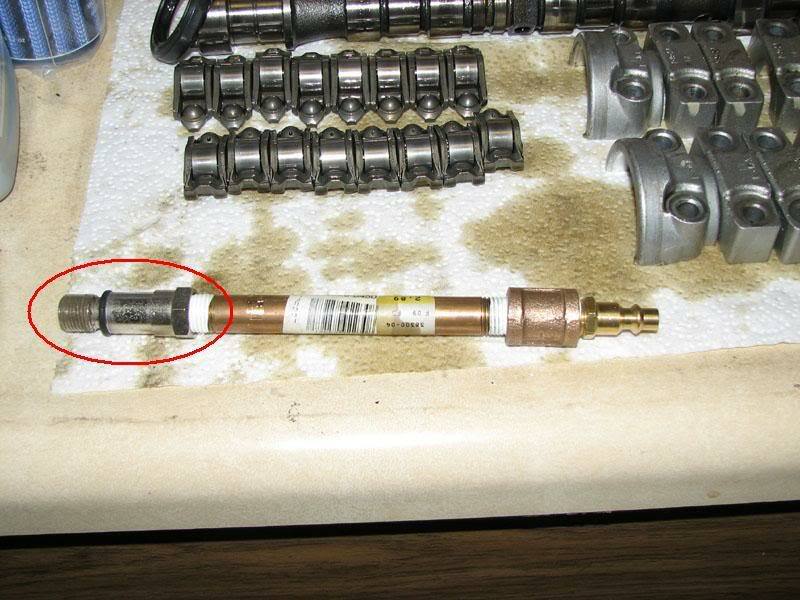 Use rags and plug all oil drain passages and spark plug holes (shown below in red). 4. 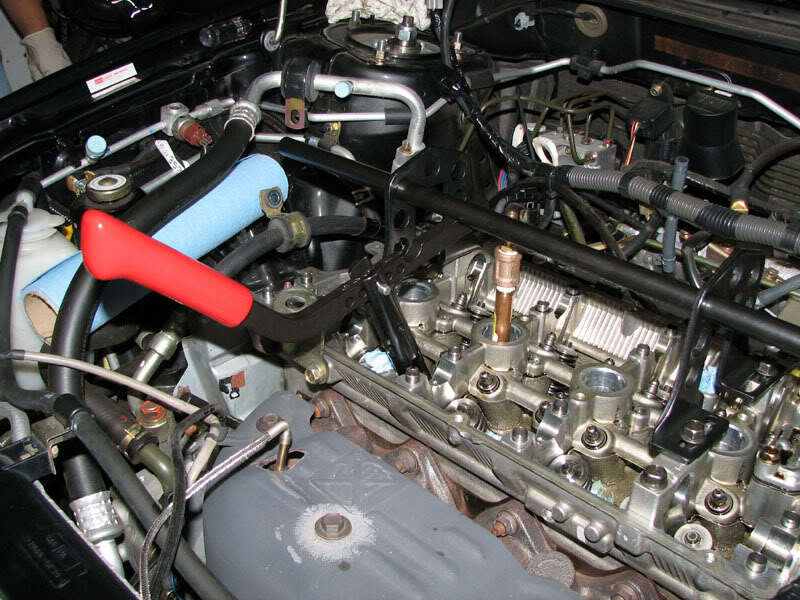 Loosen engine hanger bolts and rotate hangers out of the way (shown below in blue). 5. Reinstall cam caps to mount the valve spring compressor. 6. Bolt valve spring compressor to tops of cam caps. - Anything above 65 psi should be enough. I went up to as high as 95 psi. - Using an extension pipe on the compressor handle will make it a lot easier to hold the valve spring compressed. - Coaxial alignment of the spring compressor with the valve is critical in freeing the keepers. If your keepers are sticking, perhaps the valve spring compressor position needs to be adjusted slightly to help it line up coaxially with the valves. - I moved the posts of the valve spring compressor to different cam caps if they got in the way and prevented coaxial alignment of the tool. - The magnet pen works really well to pull the keepers off the valve. - This is the trickiest part of the install. It requires patience and precision. - I used needle nose pliers to place the keepers on the valves. - I used a plastic pick to help position the keepers. 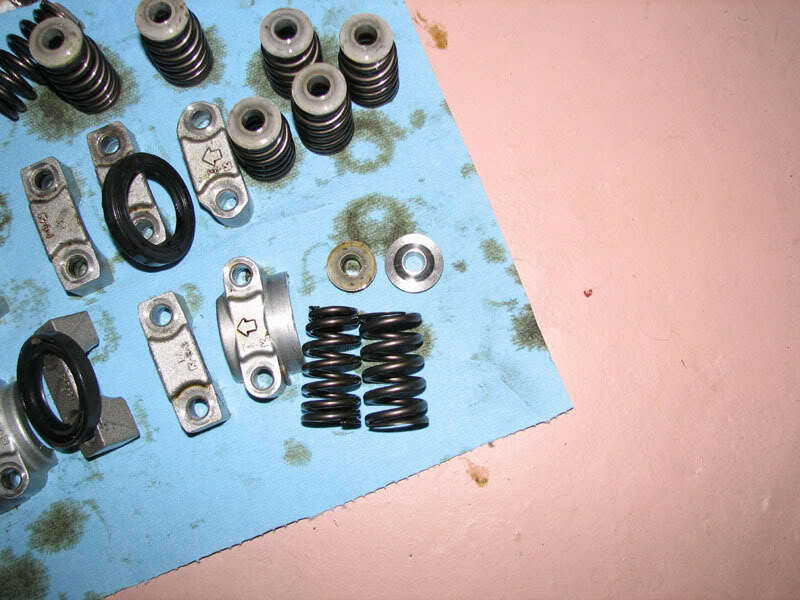 - The valve springs can be slightly decompressed to help move the keepers into place. - A pry bar or screwdriver can be used to help the retainer line up better (coaxially) w/ the valves. 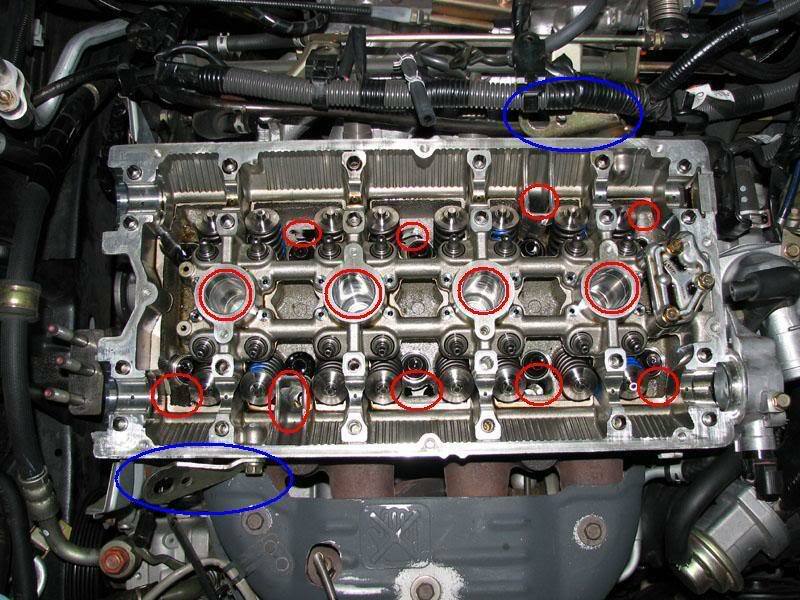 - Be sure the keepers are positioned properly before uncompressing the valve springs completely. 15. Repeat for all valves. 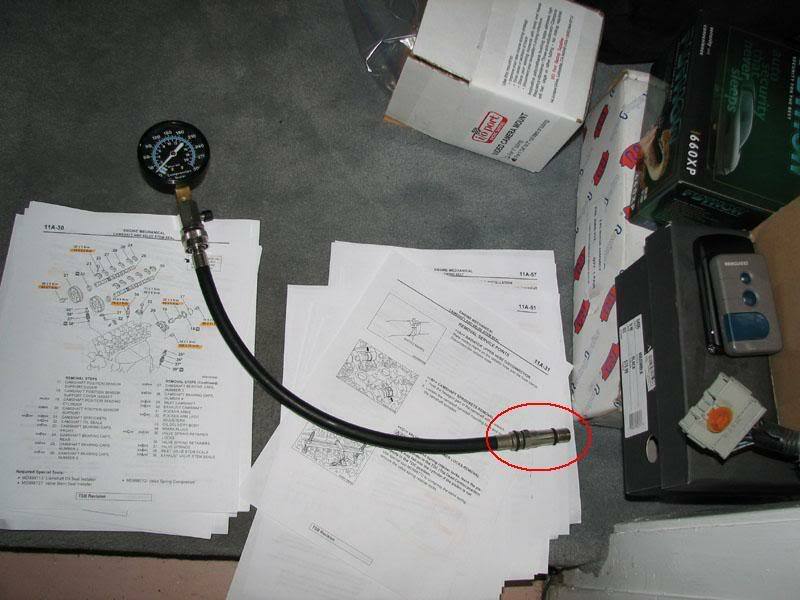 - Don’t forget to move the compressed air line to appropriate cylinder! 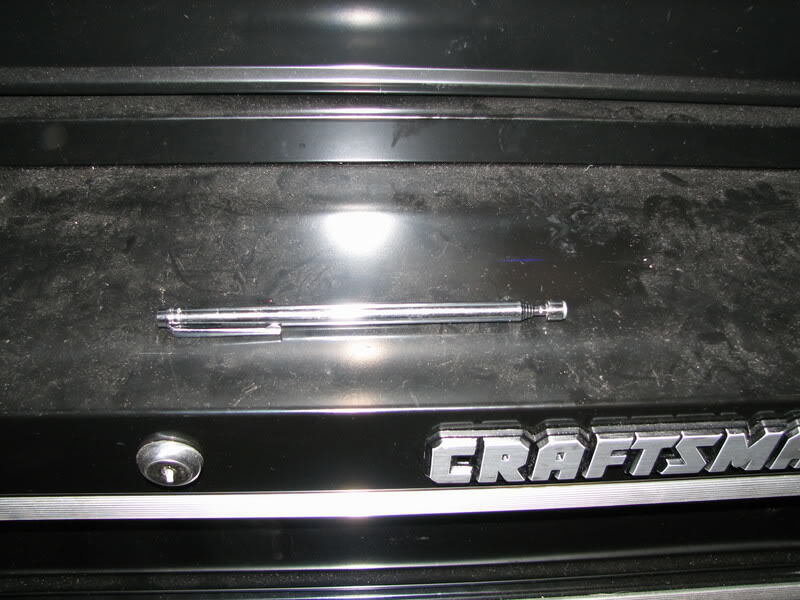 - I removed my front strut tower bar for more clearance. 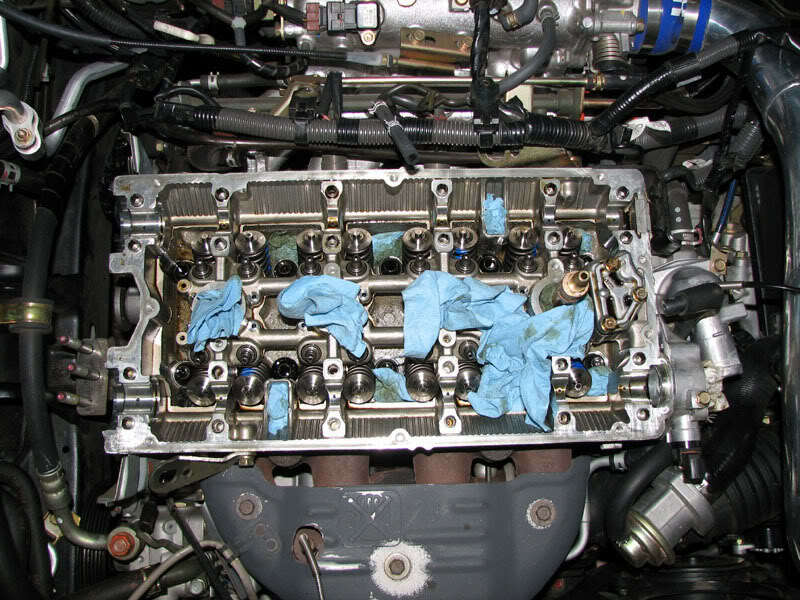 - I did all the exhaust valves first and then did all the intake valves. - Try not to lose any keepers! I almost did, but luckily found it on the ground. - And lastly, take your time and be patient! 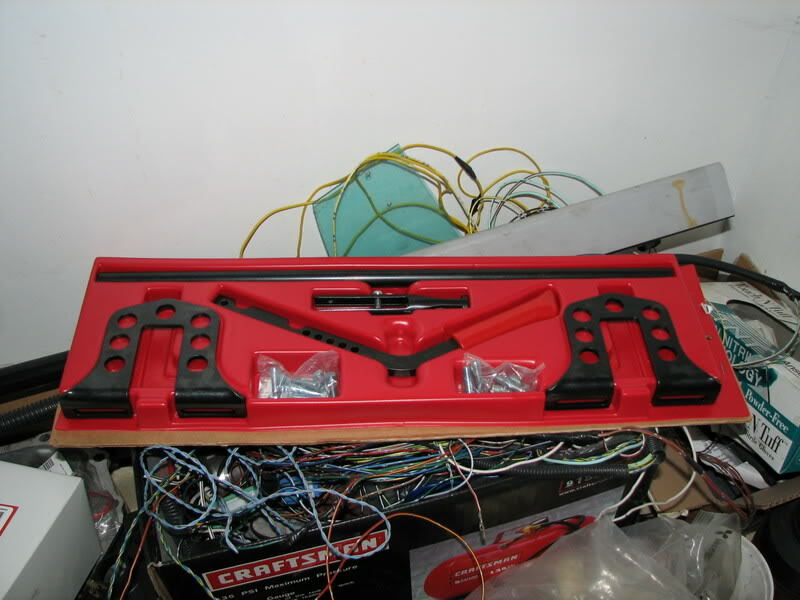 Understand the risks involved with this install before attempting it. Please use caution when performing this procedure to your vehicle. Use the information provided as a guide only as there may be better ways of performing these tasks. I am in no way responsible for any damage that may occur to your vehicle or any bodily injury sustained as a result of your work. maybe this question will sound sily but I never worked on an engine and would like to do that one day. The directions are preaty straight forward the only thing that is not to clear is the usage of compressed air. Can you elaborate on this one a little bit?? When you turn your air compressor on, the compressor motor will keep running until it fills the compressor tank to a certain PSI. There's a manual pressure regulator you set on the compressor that adjusts the compressor motor's automatic shutoff point. The lowest mine would go was 95 psi, so I just left it there. You can manually turn off the compressor when it reaches a certain PSI. Good write up...Exactly what I was looking for. Very nice write up! I had to rebuild an engine for school and had to do all that. I HATE those damned valve keepers! Good write up. I have a similiar tool. But mine has a compressor screw. Very effective. Leaves both hands free to get keepers back in. And you can slowly unscrew the compressor to be sure keepers seat correctly. The hand help compressor can be quite combersome when the keepers dont cooperate. The factory tool costs about 4X as much as this lever one, so I ended up getting this tool instead. I was trying to make this installation cost effective. The directions are preaty straight forward the only thing that is not to clear is the usage of compressed air. Can you elaborate on this one a little bit?? I think what hes asking is WHY you are compressing the cylinder with air. 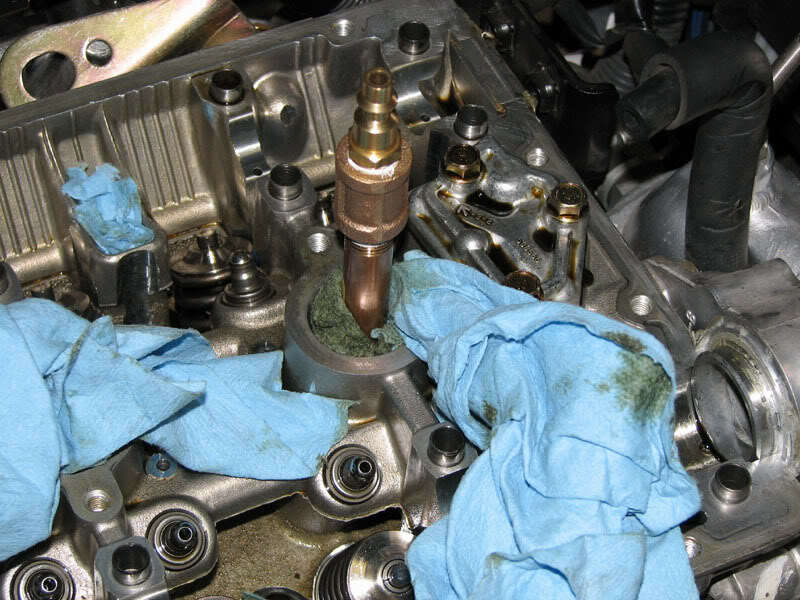 The reason you compress the cylinder with air is because when you pull off the retainers and the keepers the Valve can fall into the engine block and short of taking the head off is a bad thing. And pressurizing the cylinder keeps the valve where its at. There is no need for shop air if you rotate the pistons in the block so each cylinder is at tdc when you do it. Will prevent the valve from dropping when you compress the spring and also once the keepers are out. A tool that you can build for under $10 to remove valves out of the 4G63 head works great. It's simply a 2' long pipe that you drill holes into so you can line it up on the cam cap bolt holes. You then use a C Clamp which needs to have the bottom of the C trimmed off. Trim the round swivel on the C clamp so that it will fit into a 3/8" socket. Take a 15mm or equivalent deep socket and cut a nice window into it. Stick the socket on the C clamp, put the C clamp on the pipe, spin the C clamp handle to compress the spring and use the magnet to pull the retainers out. I've gotten good enough to replace all the valve springs and vss in about 2 hours on a 4g63 head w/ this method. I agree. The added time to pull the head means you won't have to go fishing for retainers anywhere if they decide to pop out. Not to mention it's a chance to toss on a nicer headgasket. Hey, some of us are lazy! When you have to pull the oil pan to collect your dropped keepers, it would take you less time to pull the head and do it right. That's why I plugged all the oil passages w/ rags. The rags saved me a few times. This install does require a little finesse is should not be attempted by everyone. Installing springs and retainers w/ the head on probably falls into the same logic category as installing cams w/o taking off the timing belt. A significant amount of time and work can be saved by using the shortcut method. I knew the risks going into this job and was prepared to pull my engine apart if I screwed up.